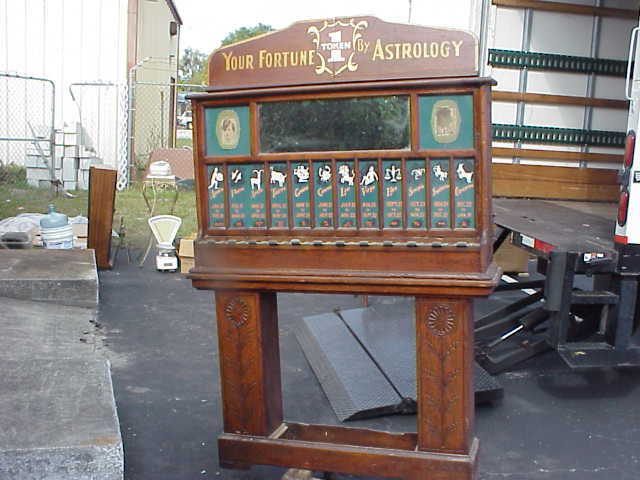 Home » Penny Arcade Machines » Your Fortune Told Astrology Machine Himebaugh Mfg. Rare Himebaugh Mfg. 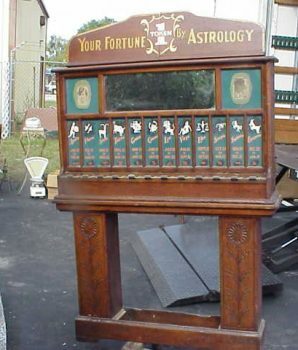 Astrology machine. Insert coin in slot for your birth month to receive astrology fortune card. Every month of the year represented. Drop coin and a printed card with your horoscope is delivered. Comes with many original cards. Solid oak case with original cards and artwork. This machine is very rare and 100% original. To see more pictures of this machine, go to the category section and click additional photos, then scroll down to find more pictures of this machine. Manufactured by Himebaugh Mfg., Philadelphia, PA.